Aeration is crucial for improving drainage, reducing turf compacting, thatch build up and increasing the health of lawns and the Megaslit is an ideal tool for outstanding turf and lawn treatment. Working depth: 9" or 12"
Safety guard is quickly removed for easy tine change. "Over the years I have found that compaction is the biggest single factor that adversely affects sportsturf. 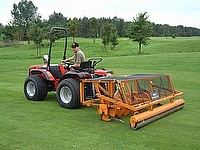 I use the Sisis Megaslit on our golf course fairways and sportsfields. It is the most effective way of achieving fast consistent deep aeration without suface disruption."